Unless these were all tested in the same session there's too much margin of error to be valid. Okay that was said, but based on what evidence? Unless they were tested side by side in the same wind tunnel session it's inconclusive. Trek isn't going to spend time testing that (or publishing if that's the case). I doubt any privateer would spend the time/money. Even if it was tested properly and the results were 8w I personally would prefer the disc bike. I tried the rim brakes on the Madone once and wasn't impressed. I sure as heck wouldn't want to service cable brakes on that bike either. Once installed, there's really no reason to ever go in and replace any of the disc brake system year to year. All this tells me is that for each manufacturer the rim and disc versions are pretty damn close and not worth getting excited about. You are free to choose which version you want with basically no aero penalty. As much as I love my rim brakes and don’t really see the point of discs on a pure road bike, I don’t think the big manufacturers will be putting much R&D into rim brake optimization. Almost all the world tour teams are on disc this season. Within margin of error. That's not a clear difference. Hey I'm skeptical that any of those bikes are significantly faster than my old Cervelo S2. I've got much smaller frontal surface area on this bike than the current fat tubes used. Wait...how are these people up in arms over disc brakes, but they are okay with direct mount brakes? I would tend to agree with the S2 being hard to beat aero wise. I’m still using my 2008 cervelo SLC-SL and my my soloist team. They are both getting long in the tooth though. i don't know about your riding style and attributes, but i was the type to go for any little aero advantage possible back when I raced. I couldn't accumulate points from sprinting, so I had to get away solo or in a small group, and aero helps there. Almost all the world tour teams are on disc this season. I guess that's what the bike company marketers want you to believe (and it looks like you've been drinking the Kool Aid). But when this was discussed a few weeks ago, it was found that the majority of world tour teams are not using disc brake bikes (10 out of 18). Of the other 8 teams, 4 are using a mix of rim and disc brakes, and only 4 are using disc brakes exclusively. The performance advantage of clinchers over tubulars is very small, and because clinchers are more prone to pinch flats and can't be ridden as fast when flat, the risk of losing a lot of time due to flat clinchers is of greater concern than gaining a little bit of time due to their lower rolling resistance. By many measures disc brakes can give better braking performance than rim brakes, by giving more consistent brake performance over a wider range of conditions. The time gained due to the braking performance of disc brakes over rim brakes is very small, and because disc wheels are slower to change and disc brake wheels have more interchangeability issues, the risk of losing a lot of time with disc brake wheels in case of flat tire or other wheel problem is of greater concern than gaining a little bit of time due to their more consistent performance. Coaster brakes were so rad! Agree on both accounts. I'd say all these aero bikes are pretty damn slick compared to the old, round tubed bikes. You can get very close to these car-priced bikes for a lot less. I've been thinking about a more aero front brake for a while. Ha, ha no kool aid here! 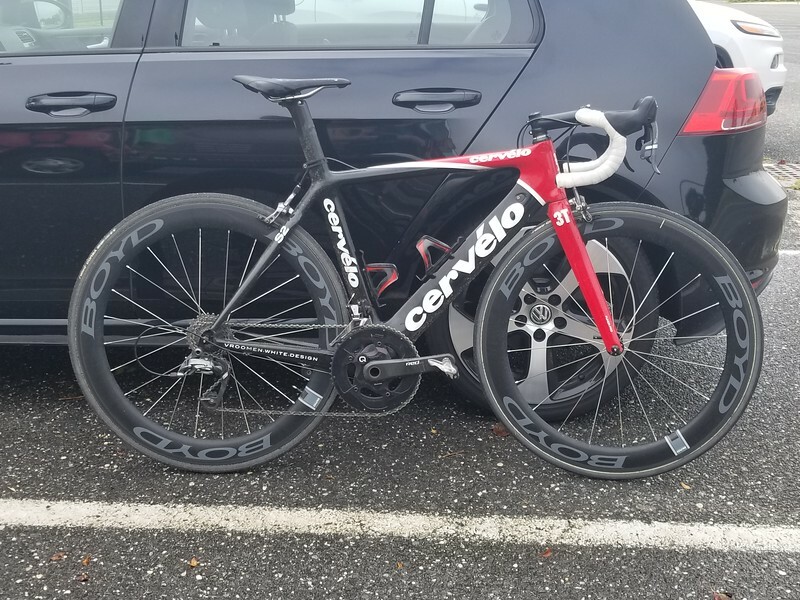 I’m still happily using my 2005 and 2008 cervelos for road cycling. I could care less to be honest, but it doesn’t take a genius to see where this trend is going regardless of the actual number of teams using disc bikes right now. It’s clear to me that the majority of R&D is going into disc brake bikes and not rim brake bikes regardless how anyone feels about it.